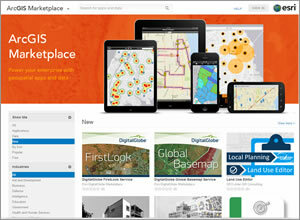 Browse for apps and data in the ArcGIS Marketplace. With the recent launch of ArcGIS Marketplace, it's much easier to find apps and data you can use with your ArcGIS Online subscription. The Marketplace is where you can obtain apps and data services from qualified providers, including Esri and its distributors and partners. All the apps in the Marketplace are built to work with ArcGIS Online so they can easily be shared with ArcGIS Online groups and users within your organization. "While there are app marketplaces that serve consumer audiences, only ArcGIS Marketplace is specifically designed to serve the needs of GIS users, making it truly unique," says Johan Herrlin, senior business strategist for Esri. "It's another facet of the ArcGIS platform." Marketplace data providers include DigitalGlobe, RapidEye, AccuWeather, and Esri. App providers represented in ArcGIS Marketplace include Latitude Geographics, Azteca Systems, con terra, and more. Anyone can browse the listings in ArcGIS Marketplace, but you need to be an ArcGIS Online subscriber to obtain free trials or make purchases. All apps in ArcGIS Marketplace require an ArcGIS Online login. This means that once you've used your ArcGIS Online login to access the app, you can use that app to access your organization's maps. Data services acquired via ArcGIS Marketplace are also accessible from ArcGIS Online, so you can add them to your basemap gallery or other apps. The number of apps and data services listed in the Marketplace is expected to grow rapidly, so keep checking back. Get a 30-day free trial to ArcGIS Online.